Fun Fact of Friday: I actually am not a fan of American Eagle jeans at all. They don’t fit me right-that or Hollister brand either. So I went against the grain of most of ya. Let me tell you about the Hollister pair, I have sitting at home-they are a “ripped skinny jeans” style I have are literally too loose in the waist, perfect in my thighs and then so tight in my calves it takes about 10 minutes to put them on. So strange and AE jeans are just not cut for me. I don’t want to get your hopes or anything but I was a real girl two days in a row. The last time I wore two pairs of DIFFERENT jeans two days in a row…um maybe last summer but I’m not entirely sure. Maybe in high school. I like to live my life in leggings and one day I will have to grow out of that but I still have another year of college at least. Today Kelsey and I went to a lovely restaurant in my town, First Crush, that I had never actually been too. Can you seriously believe that there is a restaurant in my tiny town that I haven’t been too? It’s similar to a coffee shop and they have a lot of vegan options along with a multitude of fish and salads. I actually got a salad today because I have been having a strange craving for salads (bleu cheese). We split a chocolate fondue but sadly my camera died for that portion. Never fear-we are going to become regulars here too and go back on Wednesday. Plus I just found out they serve Starbucks coffee. That is the closest place within 60 miles of me. Right near campus-how lucky and how could I not have known in the last three years I have gone to school here. I may or may not have mentioned but Kelsey is a member of my swim team and we have swam distance together for two lovely years now. You could say we were kind of the core of the distance squad. Of course during grueling practices, you are going to become close with someone. 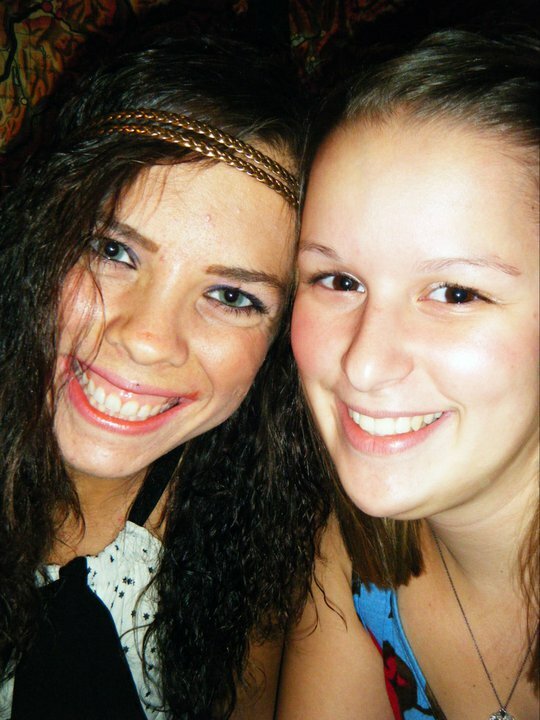 I have been the closest with Kelsey for the longest out of anyone at school so it’s nice to just hang out. She is kind of like my twinnie and doesn’t feel it necessary to go out all day every day. Or actually really at all. We are seat buddies to the max on bus rides. & 99% of the time we only go out to parties with each other. So that is how Kelsey and I roll. 1. Starbucks YAY or NAY? I like plain coffee from starbucks, I’m actually not a big latte, cappuccino, or all that jazz fan but I do love the intense flavor of starbucks. 2. Talk to me about your BFFS. I’m not much of a coffee person but I do love starbucks. I love the pictures! 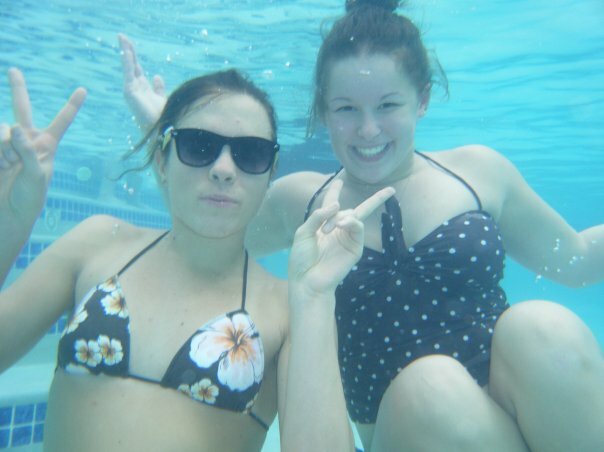 haha underwater photos are the bomb.com! 🙂 I have never swam the mile in a race and do not plan on it. Oh my goodness! We could swim together and be twinnies. The mile isn’t that bad-I swear. 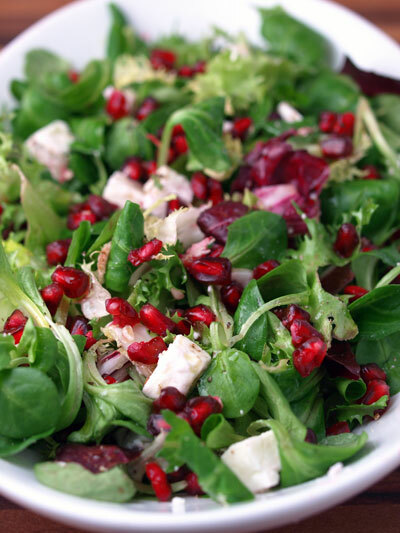 I love feta, spinach and dried cranberry salads, the BEST! I don’t drink coffee, so I’ve never really been to Starbucks! Starbucks YAY, but it is really expensive. I normally brew my own coffee. Starbucks is good, but I get their treats more than their coffee. Hahah. My BFF’s are all in college! I made a mistake of becoming friends with people who were older than me so now I am like the biggest loner in school. I was the same way in high school. My senior year I was left with barely any friends ha. Luckily they went to neighboring colleges. I haven’t had much Starbucks coffee cause I love my Green Mountain Coffee! I love how quickly and easily people make friends when they’re on teams or work together because they’re around each other ALL the time. At the summer camp I work at, our staff are all BFFs by the end of staff week because we live, eat, and do everything together. I.love.green.mountain.coffee. Omg! It’s all my campus has-have you tried the Island coconut? I have been buying out my campus every morning. Yay for Starbs, although I usually just make my own at home. Most of my besties are from my days as a swimmer! Nothing like killer 5am workouts to bond over. I am not a big Starbucks fan. It is okay, but there’s a local roaster in town that I prefer more. I’m the lame-o who’s best friend is truly my boyfriend. Yes, he is the best partner and listener for all girly activities included. I could and do spend 24 hours with him ever day foreverrrrr. I was a real girl today too! I actually went out. When does that ever happen. Starbucks = yay. I think their coffee is just okay, but I really like the lattes. I also like their petite vanilla scones. I’ve never been able to recreate them just right, which is a maayjuh disappointment. I am not a fan of plain coffee at Starbucks because of how strong it is, but I will drink their lattes on occasion. I’m more of a tea drinker, and since that’s so easy to make at home, that’s usually what I do! I don’t like the regular but only the lattes or cappaccunios. But I love adding coffee flavor to stuff! Boo on no fondue pics! I HATE american eagle jeans too! they never fit me right, even though they have a zillion styles (hollister on the other hand rocks my pants off!) Anyway do they not have a starbys near you? I thought all college campuses did! Oohh but that salad and little coffee shop/cafe sound Soooo good and too cute:) I love discovering fun new places like that! I love Starbucks but I really only like their lattes and cappuccinos, I’m not such a big fan of their brewed coffee! I never went to Starbucks in my life haha nice pics btw. You and your friend are so cute in those pics!! Starbucks is a yay for me! Cafe mocha with non-fat milk and no whip! i LOVEEEE coffee! I dont like starbucks tho- their coffee is STRONG! I loveee dunkin doughnuts tho!!! 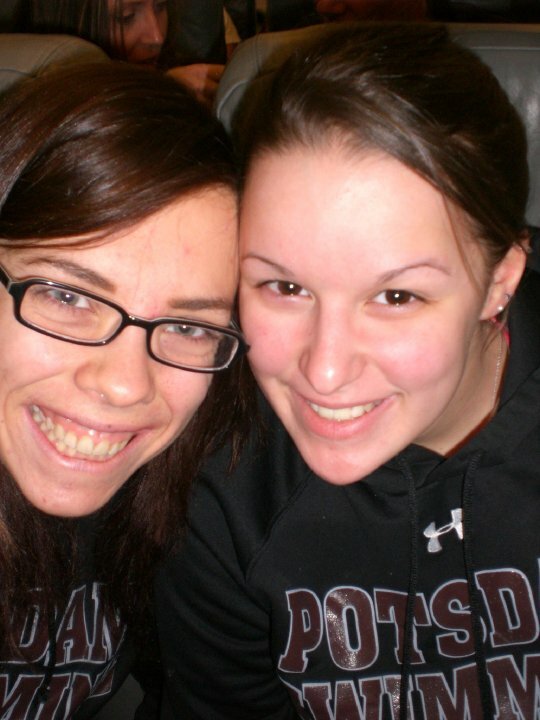 love those cute pics of you and your friend! I used to dislike AE jeans too but I have finally found a style that I like. I wear the favorite boyfriend jeans they have. I used to love Old Navy jeans back in the day but they changed their style and I never loved them again. Crazy how everyone finds different brands of jeans that work for them. Starbucks is a definite yay for me! I don’t drink coffee though. At Starbucks I get either hot chocolate, or their signature hot chocolate, or vanilla bean frappichinos. Another coffee place I go to is Biggby Coffee which so far I’ve only ever had their double dark hot chocolate. Now that it’s warming up I’ll be looking to find something like Starbuck’s vanilla bean frappichino at Biggby. I have never heard of Biggby. I think I would like it-since I like all coffees. I just looked on their website for their locations…it appears there aren’t any on the east coast 🙁 South Carolina has one though. Other than that you’ll have to travel west a bit. http://www.biggby.com if you wanna check it out for yourself…maybe you’ll find a blogger to meet up with that has a Biggby in town lol. GIRL!!! YOU ARE SO GORGEOUS!!! I LOVE LEGGINGS TOO!!! Um, I want that salad. 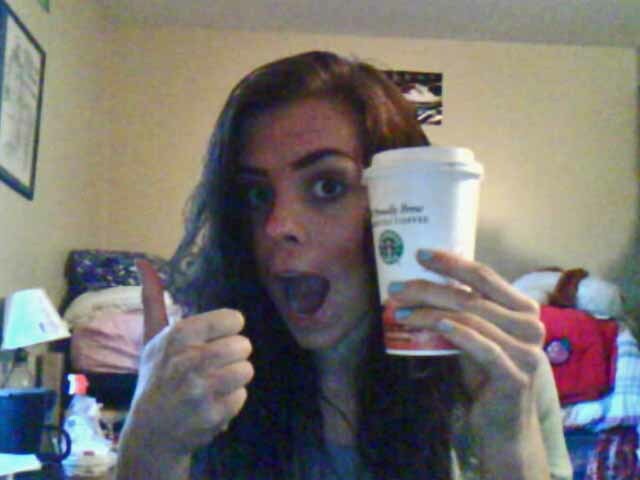 No starbucks for me:) My best friends all still live really close to me, thank goodness…I would die without them!